Here is where Rush started to really impress me! 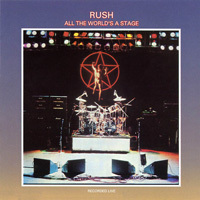 All the live albums are superb, and this, the first one, is no exception. Songs that didn't do much for me on studio recordings really come alive here and have tremendous power and presence. By-Tor, whilst being average on Fly By Night, is the highlight of the album for me here. Tremendous guitar work from Alex, haunting and passionate. But his playing is well honed throughout the album. Geddy is in fine voice from start to finish, and Neil's drumming is already world class. Anthem is another highlight, as is Something For Nothing and, of course, Working Man. But the whole thing is of a very high standard. Buy It!